Have you ever wished you could lighten up your meetings, business events or conferences in an intelligent, relevant and entertaining way? Invite Nose to Nose to come as "normal" guests (not as clowns). We mingle, listen, observe and take part. Then, at agreed moments during the day, we reveal ourselves and offer a 5 to 10 minute skit to highlight and summarise the key thoughts and ideas living in the room, much as Court Jesters did in the Middle Ages. There can be up to four such "reviews" during a day event. We bring cheekiness, impertinence and gentle chaos so as to break through some of the social and institutional conventions and fears that weigh down communication. We get people talking to each other and bring new and creative ways of looking at your issues. If you want to know more email Nose to Nose and we will gladly talk with you. For a little peek at our work, see the video below. Social Clowning at a 'Creative Dialogue' organised by the Nowhere Academy in London in September 2010. The Creative Dialogues bring together business leaders and organisational practitioners in innovative and participatory ways to examine together leading edge issues for today's organisations and for society. This particular dialogue focussed on 'Unleashing the Creative Power of Teams'. 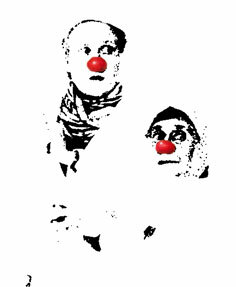 Sharon Usher and Vivian Gladwell of Nose to Nose attended the day as participants and then came on as clowns to improvise with some of the material of the day. Here is a flavour of the day!